On a cold and wet December day I felt like I needed another Mission Tennis Club fix. Here is another video I shot on the public easement of the club. In the background you can hear the cyclone fence being put up, so this was one of my last views of the club from this vantage point. It really does seem as if one could be in Tahoe, as other members have said. 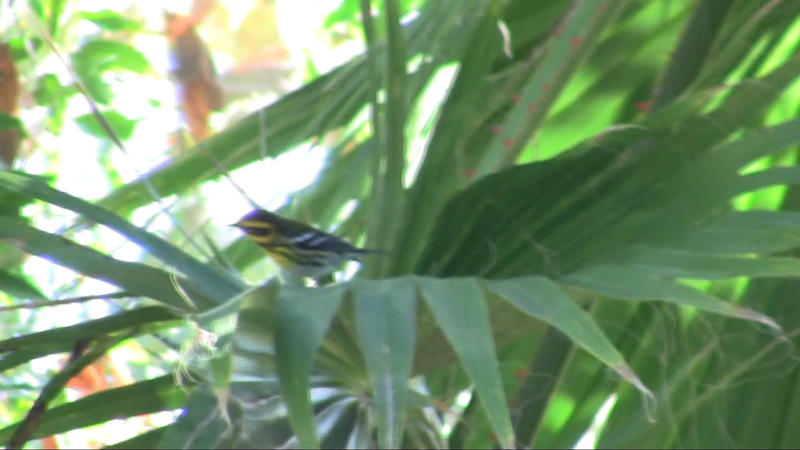 At last, using my trusty Peterson Field Guide Western Birds I have confirmed that it is a Townsend’s Warbler! I am always amazed to find warblers, but this Townsend is right at home, per the field guide “Habitat: Tall conifers, cool fir forests… oaks”. I have been on a mission lately to photograph some of the less seen but cool birds that make the Kimber Park Open Space home. Pat and Phil Gordon, from the local chapter of the Audubon Society, were here to confirm that White-Tailed Kites were breeding on the Kimber Park Open Space this summer. They published their finding in their November newsletter. I was astounded at their ability to identify birds. They quickly pointed out the beautiful Golden Eagles which overfly the area. OK, how could we not notice Golden Eagles! Phil also spotted Hutton’s Vireo, a small and inconspicuous yet pretty olive bird, which I did not even notice and then later what seemed to be a Nuttal’s Woodpecker. 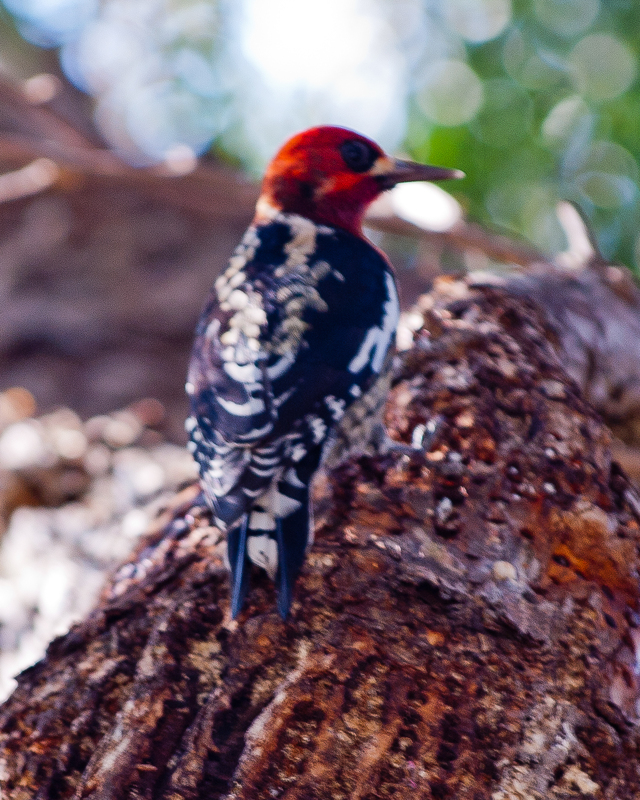 I love woodpeckers, they are so boldly colored and eclectic in their behavior. I cannot believe I never saw them before. 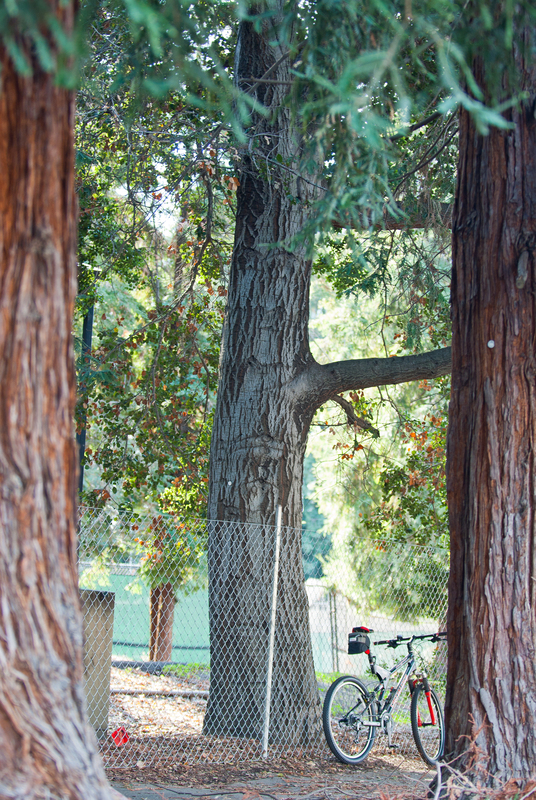 The one that Phil saw frequents the pepper tree at the extreme eastern edge of the Kimber Park Open Space. I have stopped by here often to try to photograph this guy. 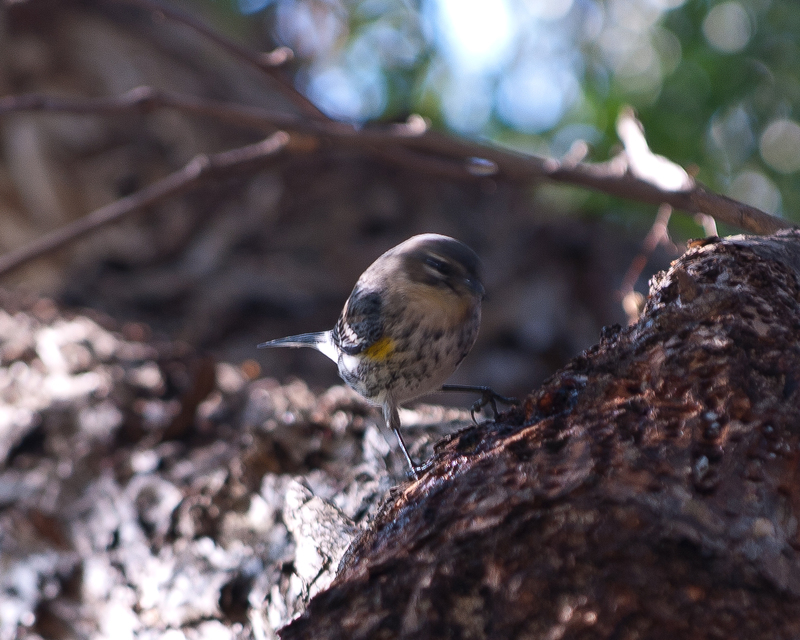 While there on December 13th I caught this pretty female Yellow-Rumped Warbler stopping by. I could hear the woodpecker, but once again he was eluding me. Again. For months on end. Harrumph. But now, thanks to Frank, one of the horse-keepers for the horses living along the foothill here, I am happy to report that I have at long last gotten a reasonable picture. Frank finished feeding the horses and stopped to ask what I was photographing. Well, I once again had missed the woodpecker (it is very camera-shy) just before he approached, but while talking to Frank it came back for a few seconds, which I was able to take advantage of. 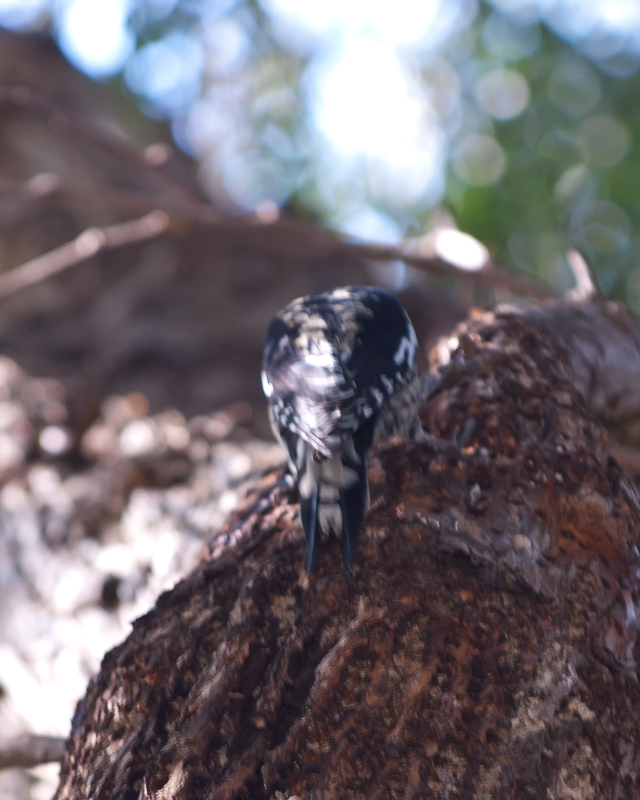 It turns out to be a Red-Breasted Sapsucker. The sapsucker appears to actually be doing just that! Another less often seen resident is the Northern Flicker. 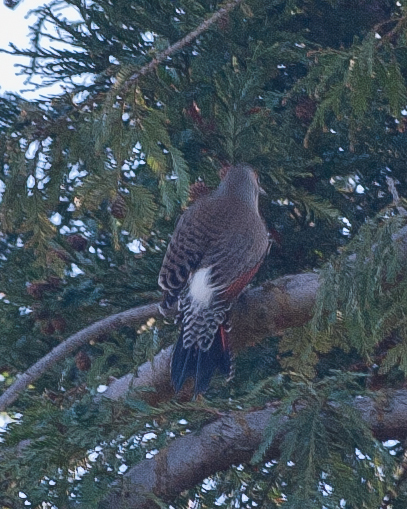 Here are a couple of pictures of a Northern Flicker on the Kimber Park open space. It is a pretty big woodpecker, unique in appearance and behavior. 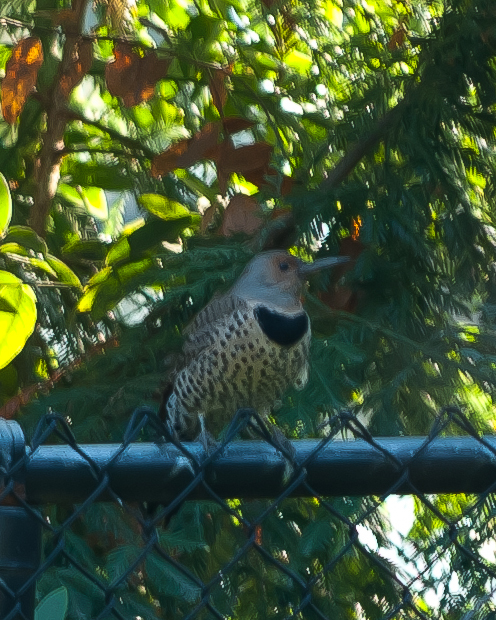 Northern Flicker showing distinctive white patch. One of the obvious attractant for the wildlife here are the many large native Coastal Live Oaks, which offer a ready supply of acorns to the birds, squirrels, deer and I am sure other creatures on the property. One of the oaks is apparently already mature in the old Kimber picture from 1939! It is enormous and I would not be surprised if it is well over 100 years old. 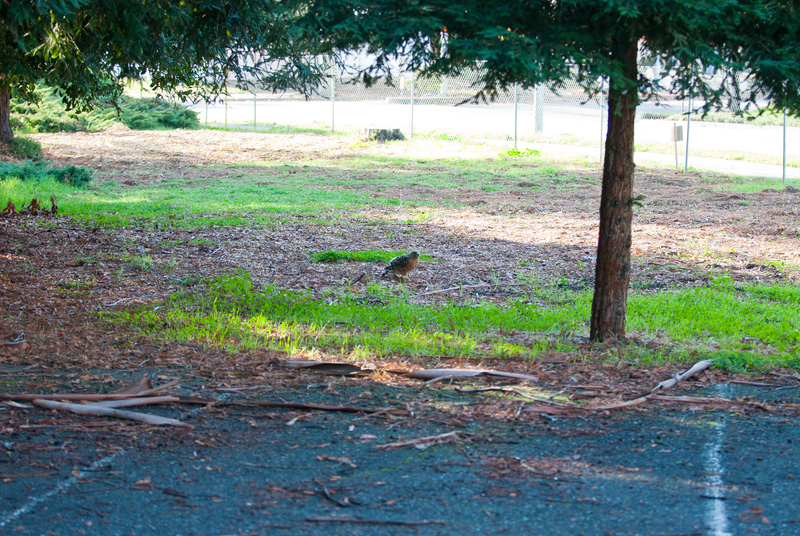 Red-Shouldered Hawk on front lawn of the Mission Hills Tennis Club. 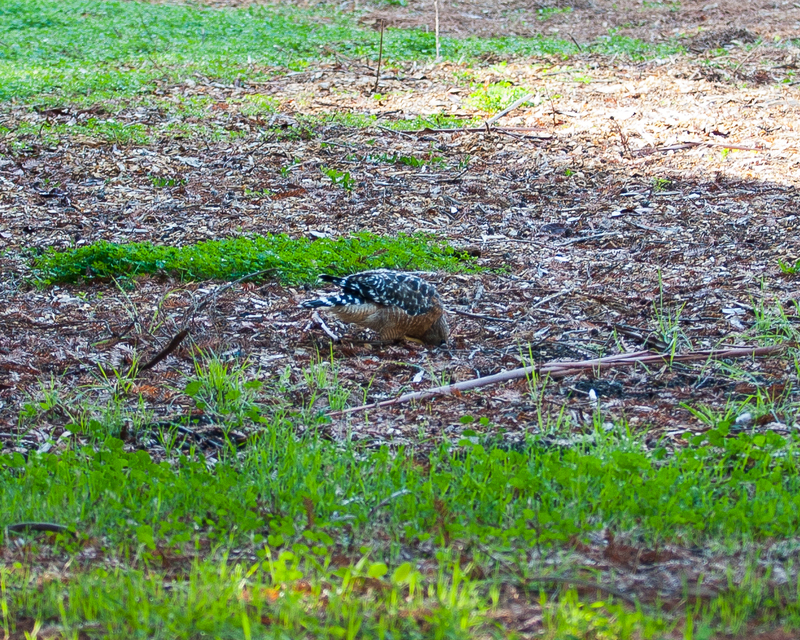 Red-Shouldered Hawk looking for food under the mulch. 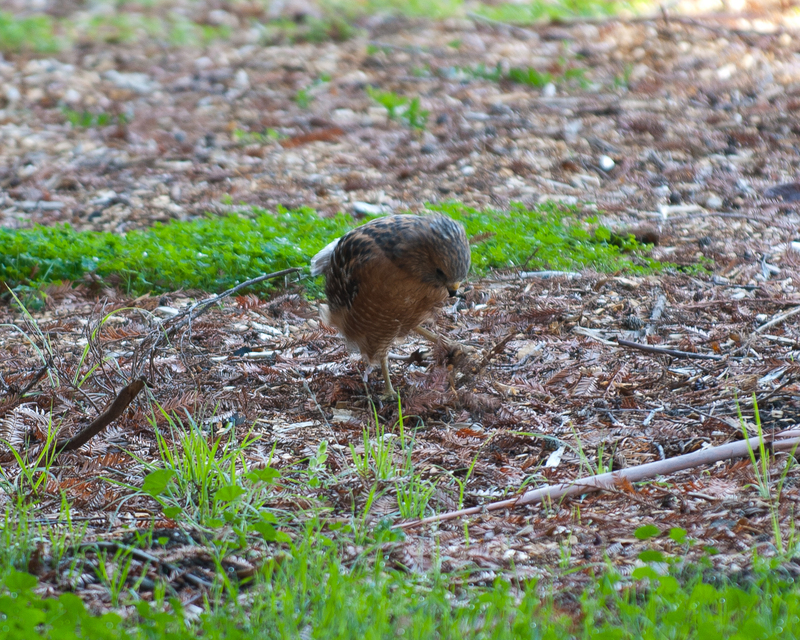 Red-Shouldered Hawk chomps down on a small meal. To any readers not familiar with this property or the associated wildlife and woodland, I hope this may help you begin to understand why the neighborhood is so passionate about preserving it. The development plans submitted to the city call for the destruction of 186 trees, mostly Redwoods and Coastal Live Oaks that are over 60 years old. In and of itself this is troubling to consider, but on the mitigating Open Space at the centerpiece recreational facility of a Planned Community in Fremont it is inconceivable. This entry was posted in Nature and tagged Nature by moderator. Bookmark the permalink. A Kimber Park resident and nature lover dedicated to the protection and preservation of the Kimber Park open space and neighborhood recreational facility. A hyper-aggressive developer has cyclone fenced a 60-year old Redwood forest and natural area and now holds it hostage in the center of a planned community, even though the property is zoned open space. After surrounding the community's open space with a cyclone fence, they are now trying to negotiate how many homes to build. Hard to believe but true. See also savekimberpark.com for more information. 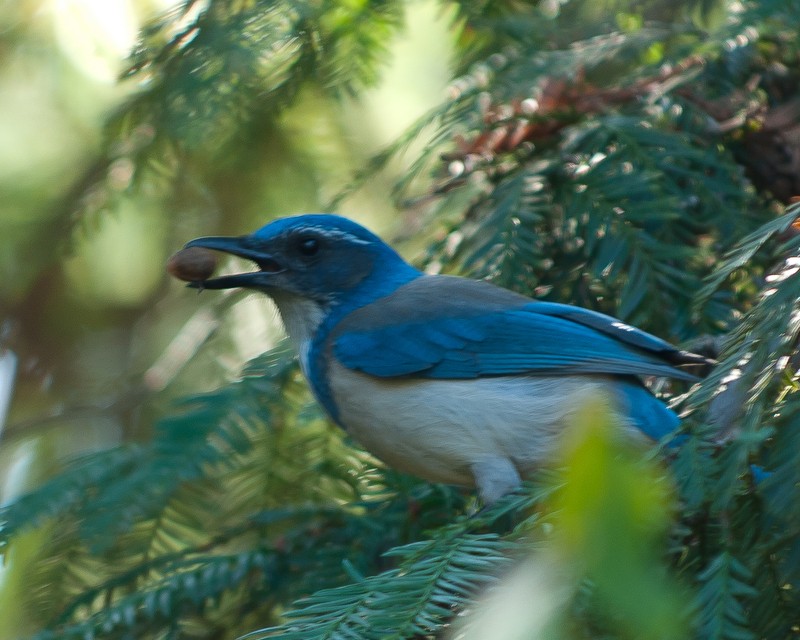 I am so pleased to see these photo’s, I have always enjoyed the wild birds in the woods here in Kimber. We have all been blessed with the open space and our Tahoe like setting. I only wish our city council were interested in the preservation of open space as much as they are interested in the dollars they might not aquire by allowing more development in an area that has always been shared with wild life. At year’s end it seems appropriate to add this photo of a Black Phoebe at the Kimber Park Open Space. The phoebe is enjoying the last rays of the sun on December 15th, 2011. I am looking forward to a brighter and better 2012 in Kimber Park. Tomorrow is another day, the first day of 2012, the year in which the Kimber Park community throws off the yoke imposed on us by the Mission Hills Tennis Club owners. Here’s to a united neighborhood overcoming greed and callousness!